My entire family gets together every year for a long weekend in Lake George, NY. It’s basically a food fiesta with some swimming and mini golf. I can’t wait! We’ll be heading there later this month so I took a poll of what my peeps wanted me to bring (food wise). “Panera chocolate chip cookies”! (That’s what we call them because they look and taste just like the ones from that restaurant chain.) You know them as the Perfect Chocolate Chip Cookies. Of course I’ll happily comply with such request, but it got me thinking. The cookie base from that recipe is amazing so how else I could use it? Then it hit me. 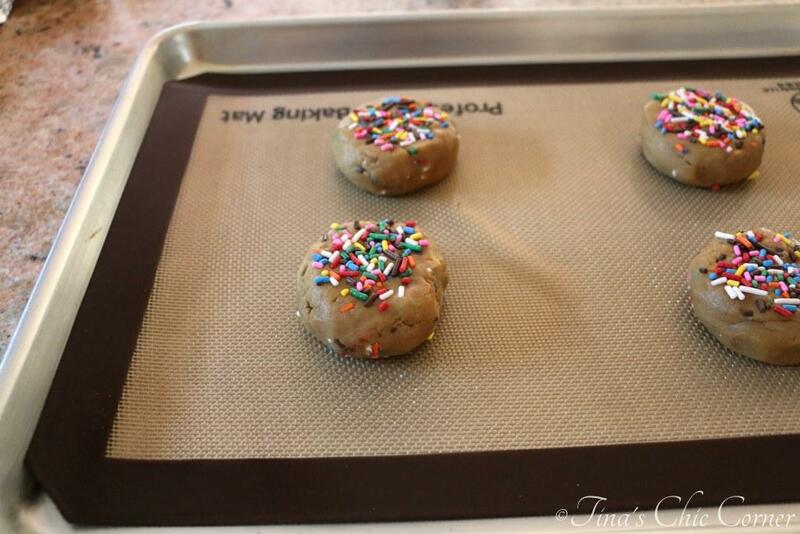 Turn them into sprinkle cookies! The sprinkles look like a fire works explosion so they’re perfect to celebrate the 4th of July! Let’s be real though. You don’t need a holiday for an excuse to enjoy these cookies! 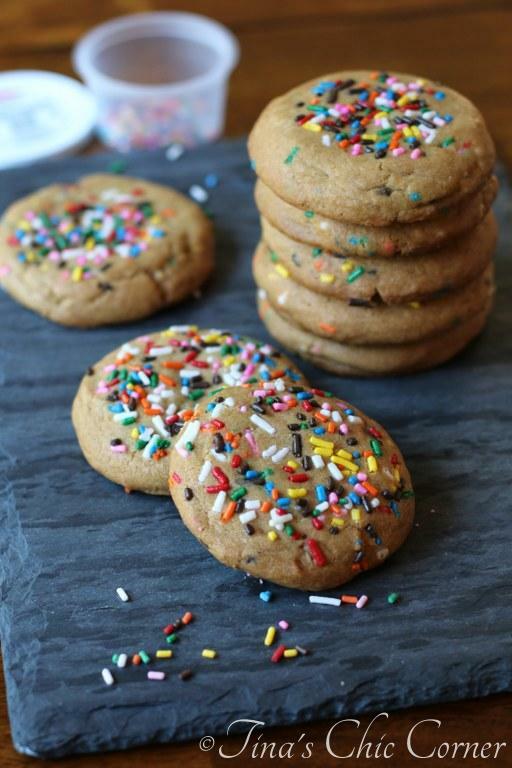 These cookies are like a chocolate chip cookie but are loaded with sprinkles instead of chocolate chips. Note: The dough needs to be chilled for 3 hours in the refrigerator. In a very large bowl, mix the butter, shortening, brown sugar, and white sugar, until light and fluffy. Mix in the eggs and vanilla, until well combined. Set the wet ingredients aside. In a large bowl, whisk together the flour, cornstarch, baking soda, and salt. Gradually mix the dry ingredients into the wet ingredients, until combined. Stir in the sprinkles until evenly distributed. Chill the dough for 3 hours. Bake them in the preheated oven for about 17 minutes. Let them rest for about 3 minutes and remove them to a cooling rack. Let’s start with creaming the butter, shortening, and sugars. Please, please, please measure the flour correctly! I’ve even got a handy dandy little sign by the ingredient to remind you of this important step. (If you click on the little sign it will take you over to my Baking 101 page, which explains how to properly measure flour.) 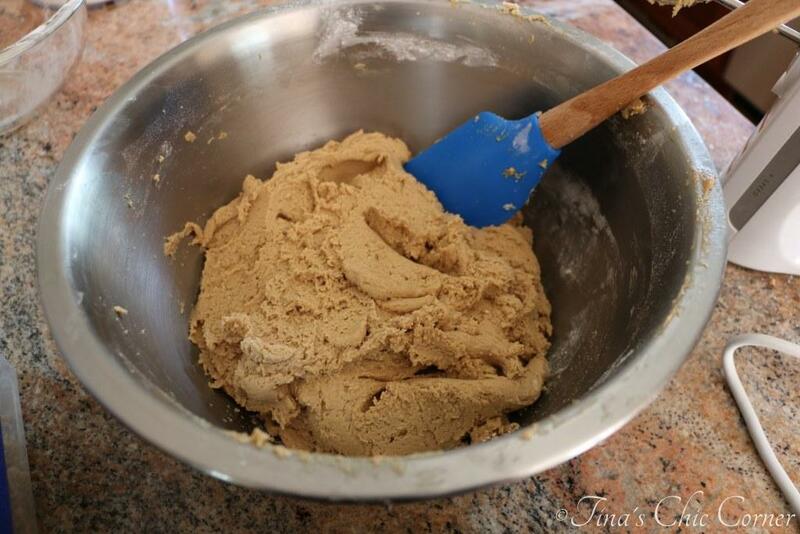 If you add too much flour then your cookies will not spread and the texture will be off. If you don’t put enough flour in (which is WAY less likely to be your problem) you’ll just get greasy discs instead of cookies. 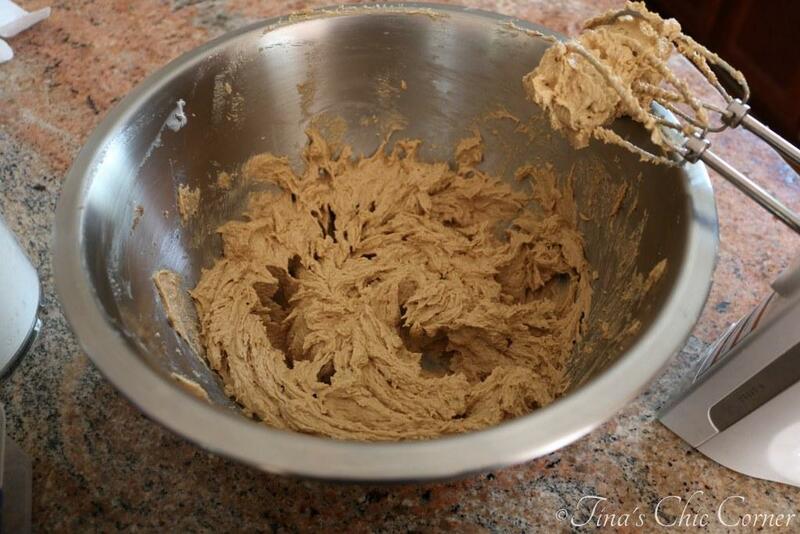 Baking Tip: Use a spoon to loosely pile the flour into the measuring cup and then level it off with a butter knife. Your cookie batter should be a tad sticky but not so sticky that some comes off on your finger. Adding additional sprinkles to the top isn’t strictly required, but it does make for a prettier looking cookie. Look at these colorful bad boys! Yup, they’re perfect to bring to that July 4th BBQ. Whenever I see sprinkle (or funfetti) cookies, it’s usually a type of sugar cookie. I wanted to do something a little different. By using brown sugar in this recipe, these cookies are a lovely light brown color and they are super chewy. 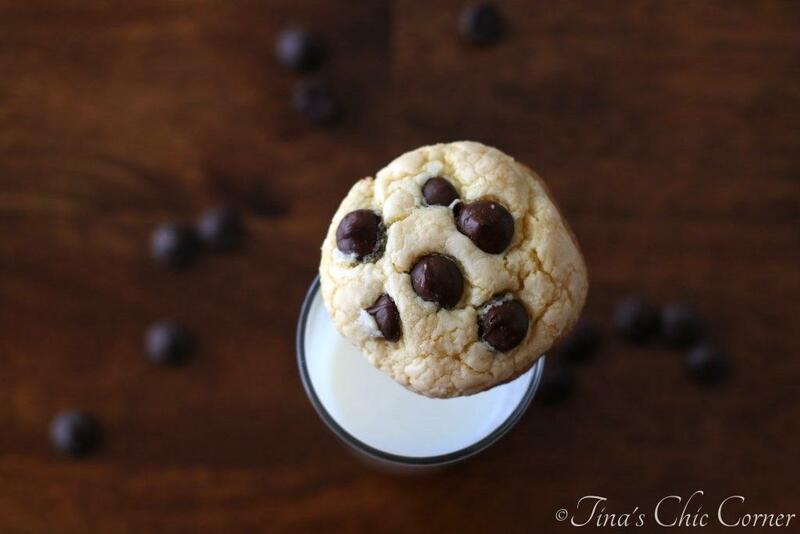 If you love the base of a standard issue chocolate chip cookie, then you’ll love these. My husband loves it so much that he’s been known to bake chocolate chip cookies without any goodies in them at all. The flavor focus here is completely on the cookie base (you know, because sprinkles really don’t have much of a flavor of their own). My little two nephews are obsessed with sprinkles lately so I want to bring some of these to our Lake George trip. No problem. I popped some in the freezer and they’re ready to go. I just hope that my husband and I can keep our hands off of them! Here are some seriously amazing chocolate chip cookie recipes. 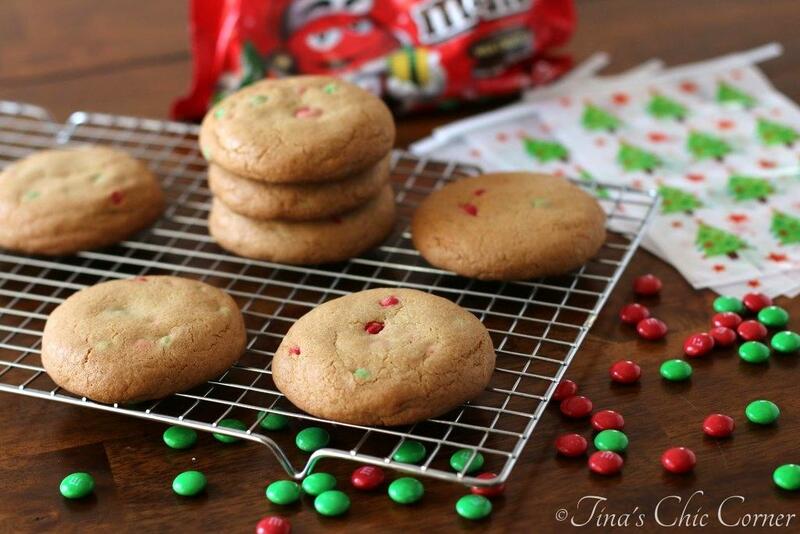 These cookies look SO cute and festive Tina!! 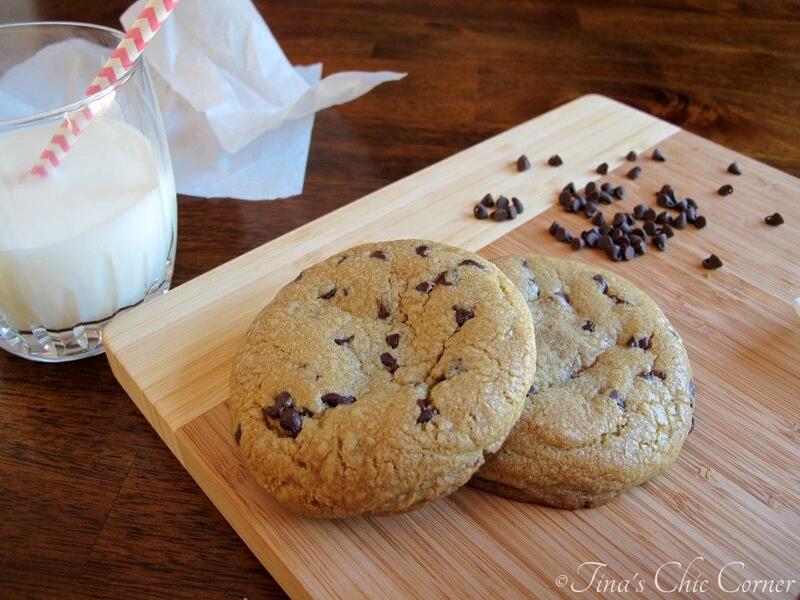 Such a good idea to turn a favorite chocolate chipper into a new cookie! These are so fun and festive – your family is going to love them!! Happy 4th of July to you lovely one. 🙂 Hope you are having a great weekend. Even though I am in Australia, i still love 4th of july, my American friends go all out with the celebrations and we always Skype so I can see the fun and festivities. I remember being in the States over this weekend a decade ago, I was working at a Summer camp, one of the girls dads organised fireworks over the lake, it was magical. 🙂 Anyways, I do hope you are well and enjoying. Love these little cookies, super cute, i like that you freeze them ready to go. Wouldn’t be able to do that, if I know I have a sweet treats like that, i hear them calling me to eat em. LOL! Quit being stingy with the cookies! I need cookies!! These are really cute cookies! I love all the sprinkles! The cookies look amazing, Tina! Love how colourful and bright they are! I’m always read to make a ginormous batch of cookies! 🙂 Sprinkles are so fun – love these for bringing to a party! These cookies are aboslutey adorable Tina! I love the addition of sprinkles! I’m sure your family loved them! Who doesn’t like adorable sprinkle cookies?? I love that your original recipe is known as Panera chocolate chip cookies…I actually stare those down every single time I’m at Panera! Haha…you and me both at Panera! This explosion of cuteness is perfect for the fireworks! These are so fun and when you’ve got a reputation as Panera copycat, then you KNOW these are good! Thanks so much Mary Frances! I hope you had a lovely holiday weekend. I love anything with sprinkles. They so make me smile! SPRINKLES! 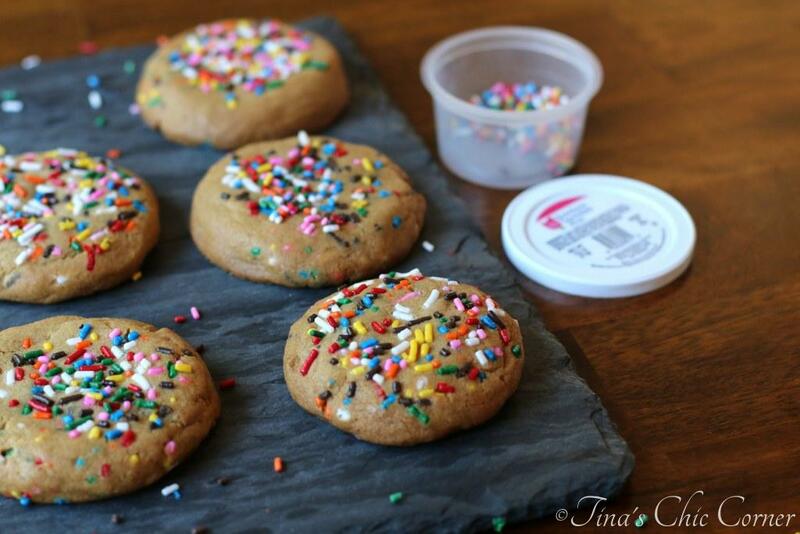 I love these cookies because, well sprinkles and they are colorful and I imagine crazy good!